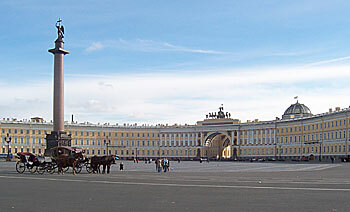 PALACE SQUARE is the main square of the city. It owes its name to the Winter Palace of the Romanovs, a grandiose edifice of green color with abundant sculptures on the roof. It is the oldest building in the square. Its construction was started in 1754 during the reign of Peter’s daughter, Elizabeth, who wanted the residence to demonstrate Russia’s growing might. It was completed in 1762, in the reign of Catherine the Great. The Winter Palace was built by the famous architect Bartholomeo Rastrelli, who was an exponent of the Russian Baroque style. The palace has over 1,000 rooms, 117 staircases, about 2000 windows. The Winter Palace is now a part of the Hermitage Museum, which is the largest museum of this country. The semicircular building of yellow color is the General Headquarters of the Russian Army (the General Staff) building, the prime example of St.Petersburg’s Classical style. The 600 meter long semi-circle broken by a large archway was designed by Carlo Rossi and built between 1819 and 1829. The building formerly housed not only the military headquarters but also the Ministries of Foreign Affairs and Finance. The arch is surmounted by a bronze group of a victory chariot (by Demut -Malinovsky and Pimenov) commemorating the victory of Russia in the war of 1812. An impressive 10-meter tall sculpture of the chariot of winged Glory drawn by six horses was created by Pimenov and Demut-Malinovsky. In the center of the square stands another memorial to the same victorious campaign and to Napoleon’s defeat - the Alexander Column erected by Nicholas I in memory of his brother Alexander I. The column was designed by Auguste Montferrand. A huge pillar which is 47,5 meters (156 feet) high and weighs over 600 tons stands on the pedestal hewn out of a single piece of granite. The base is decorated with bas-reliefs depicting the rivers that the Russian troops had to cross in pursuit of Napoleon and allegories of Wisdom, Plenty, Victory, Peace and Justice. In 1832 it took more than 2,000 soldiers and 400 workmen using an intricate system of ropes and pulleys, to erect the column on its high base, where it still stands without any additional support. An angel symbolizing peace established in Europe after the end of the war crowns the column. The statue was created by Boris Orlovsky.